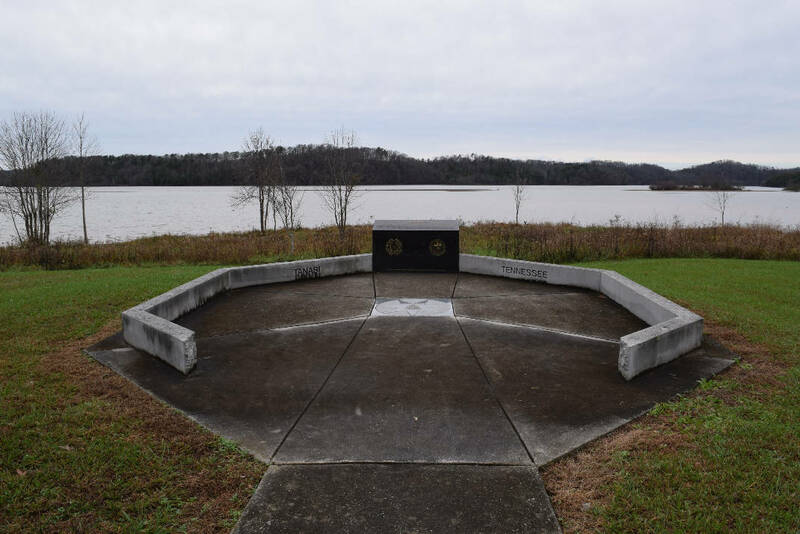 The Tanasi Memorial is located about 12 miles south of the Sequoyah Birthplace Museum in Vonore, Tenn. Tanasi, the state of Tennessee's namesake, is one of two principal Cherokee town sites that are among the subjects of a bill in Congress that seeks to return 76 acres of ancestral land in Monroe County to the Eastern Band of Cherokee Indians. Last week, more than two years after it was introduced in the U.S. House and nearly 180 years after most Cherokee were forcibly removed from their homeland, the Eastern Band of Cherokee Historic Lands Reacquisition Act was reported ready for the House floor. The legislation introduced by U.S. Rep. Chuck Fleischmann, R-Tenn., in September 2015 seeks to return 76 acres of Cherokee homeland that was mostly inundated with water when the 129-foot-high Tellico Dam became operational in 1979. Areas that were once historic tribal headquarters along the Little Tennessee River were flooded. "I was pleased to introduce the Eastern Band Cherokee Historic Lands Reacquisition Act last January after extensive conversations with the Eastern Band regarding the specific lands, which comprise a portion of the southeastern part of my district in Monroe County," Fleischmann said in a statement on the action. "After introducing the legislation, I received overwhelming community support, as well as the strong support of county leadership," he said. "I remain steadfast in my dedication to protecting the historic home of the Cherokee Indians and promoting the economic development of the region." POLL: Do you think the government will reopen for business on Monday? Fleischmann also expressed his thanks to the Committee on Natural Resources for taking up the bill. Officials in his office said the legislation moved through markup by the Committee on Natural Resources easily, with only minor technical changes suggested from the Department of Interior. "I look forward to the legislation going to the [House] floor in the near future," Fleischmann said. The land in question contains sites that include the Cherokee towns of Tanasi and Chota, two principal towns and de facto capitals of the Overhill Cherokee living in East Tennessee, and the birthplace of Sequoyah, the man who invented the Cherokee's written language and established the first national bilingual newspaper. The bill, if signed into law, would make the 76 acres reservation land and would allow the tribe to build facilities for interpretive and educational programs and other types of operations. When the Tellico Dam impounded the Little Tennessee River, 276 local families were displaced, some of whom willingly sold their property while others had to be forced out through condemnation, TVA officials said in 2015. There were no existing Cherokee communities at the time the dam was completed to create what would become a 15,560-acre reservoir. Although the controversial Tellico Dam roused objections from the tribe, TVA remained sensitive to Cherokee concerns, according to Max Ramsey, who worked for TVA in the 1970s when the dam was planned and built. He now works with the Eastern Band of Cherokee Indians in future planning and other affairs. On Thursday, Ramsey said the basic parts of the original bill remained intact through the process. "There were no questions raised," Ramsey said of Wednesday's committee action. "It went straight through." The three federally recognized tribes of the Cherokee — the Eastern Band of the Cherokee Indians, the Cherokee Nation and the United Keetoowah Band of Cherokee Indians in Oklahoma — all have ties to the Appalachian Mountains and the Little Tennessee River Valley. Ramsey has been an integral part of efforts to preserve those ancestral lands and Cherokee history. Of the 76 acres, the largest tract — 46 acres — comprises the property that houses Vonore's Sequoyah Birthplace Museum, opened in 1986 as a memorial to Sequoyah and Cherokee history. Sequoyah, born in 1776 about a half mile from the museum grounds, fought on the side of Gen. Andrew Jackson against the British and Creek Indians in the War of 1812. He also introduced the Cherokee syllabary in 1821, and in 1828 launched the first bilingual newspaper in the U.S. The act, if passed, would make these lands essentially reservation land, Ramsey said. "The situation now, of course, is [the legislation] still has to get into the Senate," he said. Fleischmann is working on that now, and he's optimistic about the legislation's future. "This issue is extremely important to the history and heritage of the Eastern Band in the congressman's district, and he is working closely with his counterparts in the Senate to secure a sponsor," Fleischmann's press secretary Kasey Lovett said via email. "Next, the congressman is optimistic that the legislation will be voted on by the House, pass the Senate, and be signed into law by President Trump," Lovett said.